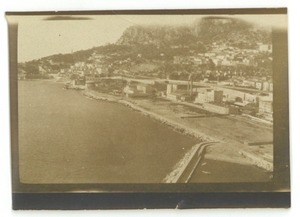 Bar-sur-Aube (France) - Clint is enclosing a few photographs that he took while on leave, only a few of which he lost in the development process. He's not sure when they'll be setting sail, but he thinks it might be on the 20th of April. 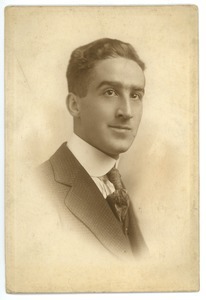 Portrait of Clinton T. Brann. 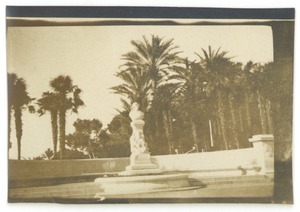 Monte-Carlo (Monaco) - Fountain with statue on the terrace at Monte-Carlo. Monaco - Coastal view of Monaco. 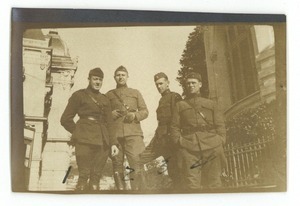 Monte-Carlo (Monaco) - From left to right, Lieutenant Stack, Major Sampson, Lieutenant Hartigan, and Lieutenant Miley standing on the steps of a terrace at Monte-Carlo. 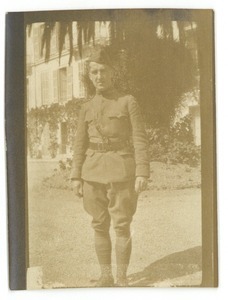 Menton (France) - Clinton T. Brann in uniform in front of a hotel in Menton. 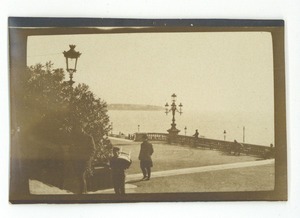 Monte-Carlo (Monaco) - A seaside terrace. 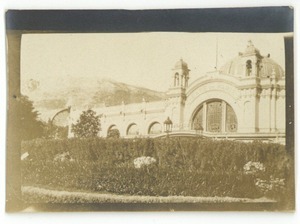 Monte-Carlo (Monaco) - Exterior view of the Cafe de Paris and its gardens. 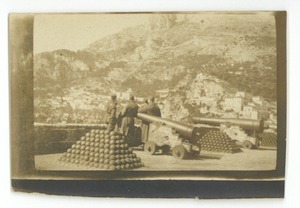 Monte-Carlo (Monaco) - Officers, cannons, and stacks of cannon balls at a garrison in Monaco. 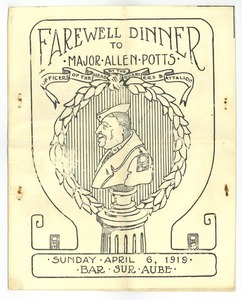 Bar-sur-Aube (France) - Pamphlet describing the farewell dinner for Major Allen Potts from the First Army Headquarters. 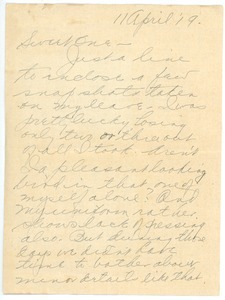 Includes illustrated cover, list of members of the Headquarters Battalion Officer's Mess, dinner menu, list of event contributors, and a poem dedicated to Major Potts.